What kinds of tasks are suitable to being assigned to collaborative robots in the healthcare industry? Collaborative robots (cobots) from Universal Robots (UR) are designed to meet the healthcare industry’s specifications for accuracy, precision, and hygiene. These cobots in the healthcare industry are performing a wide range of tasks from packaging medical devices and implants to assisting in surgeries. They can be used for mixing, counting, dispensing, and inspection to deliver consistentresults for business-critical products. Sterile handling and assembly of the small, delicate parts that are used in prosthetics, implants, and medical devices are areas where the use of UR cobots is suitable. Why do collaborative robots prove better at such tasks? Industrial robots are usually preferred in large manufacturing plants for activities like assembly line, dispensing, welding and even processing. For years manufacturers have been weary of implementing such robots simply because of safety concerns and as they are space consuming, heavy and expensive, especially considering the fact that they require a safety cage or enclosure to avoid any contact while co-working with humans. Human and robot system interaction in industrial settings is now possible due to ISO/TS 15066, a new ISO technical specification for collaborative robot system safety. The certification legitimises these robot systems or co-bots and ensures that they are properly safeguarded. The main aim of automation is to mass-produce high quality goods and increase the supply to market. Today, companies look at innovative new technologies that will create efficiencies and streamline production so they can remain agile in the market place. What is the RoI when traditional manual processes are switched to cobots? To calculate your total robot investment you must include the initial investment and take into consideration fees for additional system accessories and integration charges that you may incur. Consider future maintenance costs and whether or not a particular robot can be easily redeployed within your business to meet the changing needs of your production. Look at whether you need to change the layout of your factory floor if you’re looking to deploy traditional industrial robots, as this can be a big business expense. Also factor in costs related to upgrading or updating the technology and take into account feature add-ons. On the other hand, deploying a collaborative robot, for example, will mean your integration costs will be minimal due to the ease of use, flexibility, small footprint, easy programming and the ability for you to update and maintain the technology in-house. Collaborative robot technology can be set up easily, programmed, reprogrammed and integrated into a business by virtually anyone, which means you don’t have to employ specially trained engineers or technicians to integrate and maintain the robot. Automation using collaborative robots is easy, it will save you time and it means your production won’t be offline too long during set up. This means you will also save money and time on recruitment and training processes. What is the set up time and training required to install and run such cobot systems? One of the essential benefits of the cobot is its easy deployment. 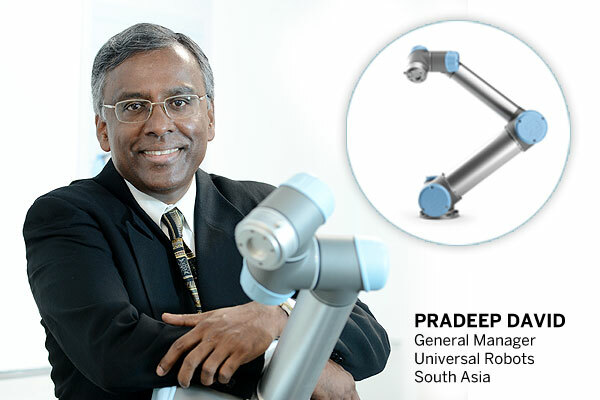 UR has revolutionised robot set-up, reducing typical robotic deployment to a matter of hours. This is a key in an industry that is committed to providing the best healthcare solutions for all people to enhance their lives. The cobots are easy to program and the first set up takes less than one hour. They can also be moved easily around the production facility for multiple applications. The days of hiring expensive external consulting every time a robot has to be programmed are over. Patented technology let operators with no programming experience to quickly set up and operate our cobots with intuitive, 3D visualisation. All they have to do is move the robot arm to the desired waypoints or touch the arrow keys on the easy-to-use touch screen tablets. The cobots come with an average payback time of 195 days. That’s the fastest in the industry-quite simply because they are void of all the added costs traditionally associated with automation such as external programming resources and shielded work cells. Could you describe a typical project completed at in the healthcare industry as an example of a cobot in use and the resulting advantages for the user company? UR has been working with Aurolab which is associated with Arvind Eyecare Systems, based out of Madurai. The labour force at Aurolab increased from 15 to 700 and production improved from 150 to 10,000 intra ocular lenses (IOL) per day. Today, they export their lenses to over 130 countries due to their superior quality. Aurolab has seen a 15 per cent increase in the annual product output. The cobots have increased affordability and helped people regain their visions at lower cost, and have considerably reduced the power consumption and increased the quality. What is the market for such equipment globally, in terms of sales growth in the last two years and projected revenues in the next few years? According to the market research report, the collaborative robots market is expected to be worth $ 4.28 billion by 2023, growing at a CAGR of 56.94 per cent between 2017 and 2023. The multi-fold growth is attributed to high ROI rates and low price of collaborative robots leading to growing attraction from SMEs, and increasing investments in automation by industries to support Industry 4.0 evolution. UR have been doubling every year as we have witnessed the 100 per cent growth in the last couple of years. We hope to continue this growth in the coming years as well.